Soup and salad. One of my favorite meals. I had the lentil soup bubbling on the stove, I just needed a salad to go along with it. I opted for a straightforward, assertive balsamic vinaigrette. 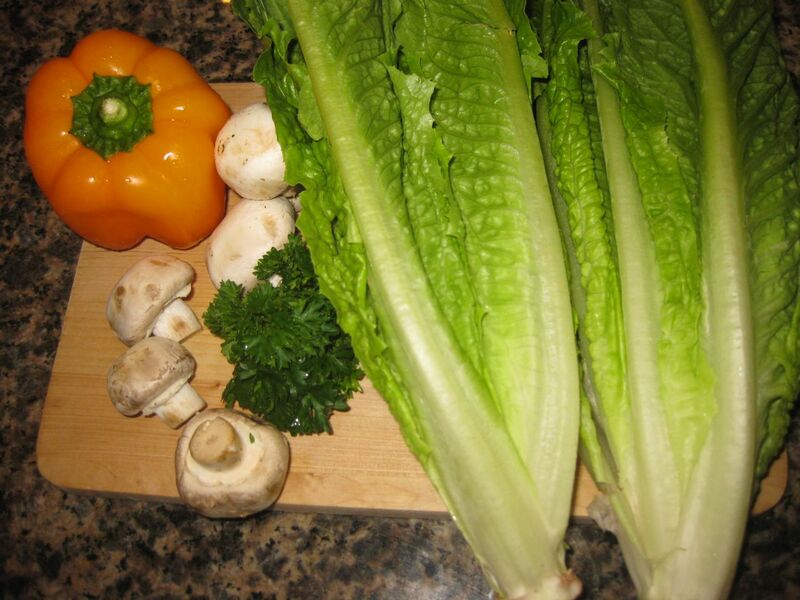 I like extra crunchy salads to go with soup, so I grabbed the romaine lettuce and a really crisp bell pepper. 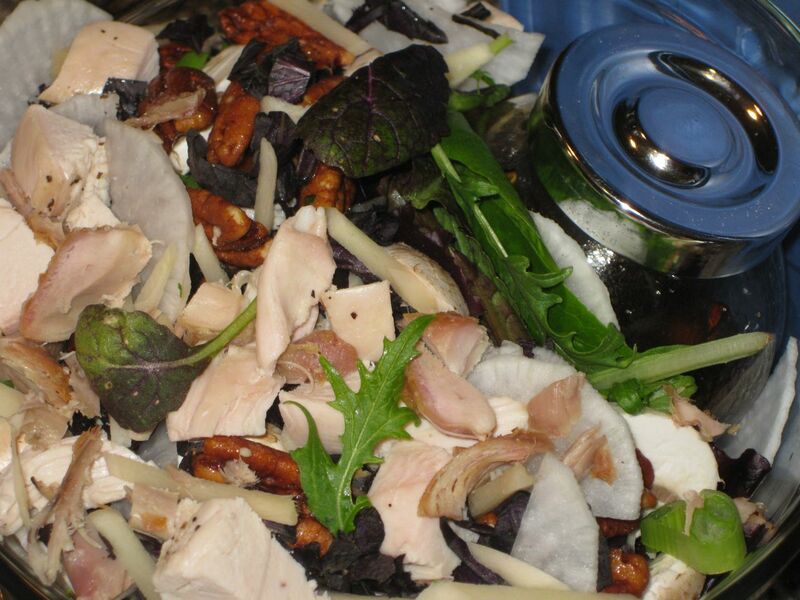 I added lots of mushrooms to soak up the vinaigrette and help deepen the flavors of the salad. Parsley for fun, and I was ready to chop. 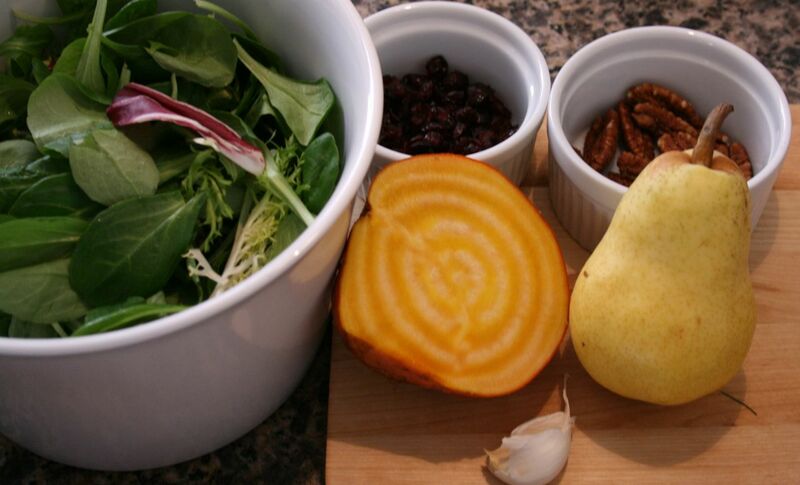 Simple ingredients, ready to be transformed into a delicious salad. 1 orange bell pepper, seeded and sliced. 1 fistful of fresh parsley, chopped. As usual, I started with the balsamic vinaigrette. I like making that first so that the garlic has time to mellow and infuse the salad dressing with yumminess. Once my vinaigrette ingredients were in the small jar I had on hand, I built my bed of romaine lettuce. I sliced up my bell pepper and mushrooms, and tossed them over the greens, and then I chopped the parsley and sprinkled it on top. Once the soup was dished up and ready to eat, I drizzled my vinaigrette over my salad, tossed it, and served it up. 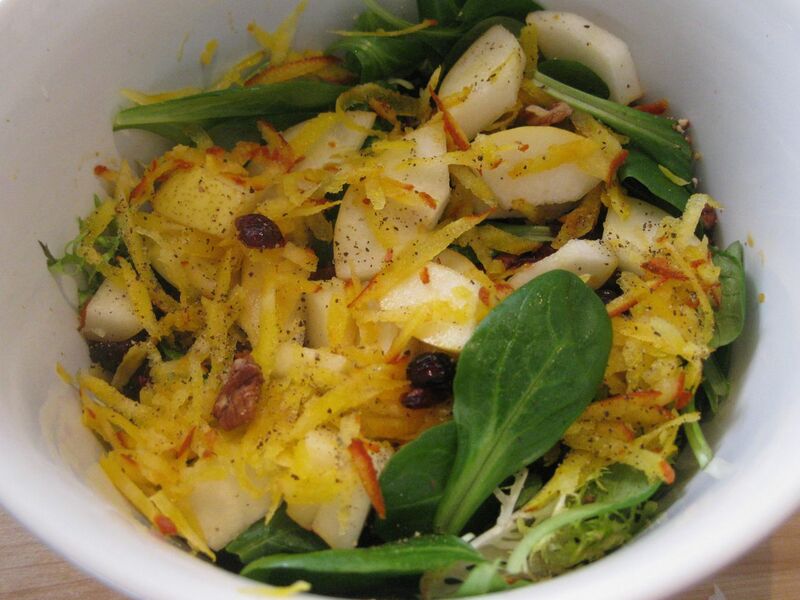 Delicious, straightforward, hearty salad. It was perfect with the lentil soup. The flavors complemented each other, and we devoured it all. I really like parsley with a good balsamic vinaigrette — it’s a remarkably simple herb with a flavor that blends well. Kidney beans work particularly well with balsamic vinaigrette, bell pepper, and mushrooms, so that’s my first choice. Leftover dinner meat, like roast chicken or sliced steak, would also work well. This one is easy to pack — put all of the salad ingredients into a nice large glass or stainless steel container with a good sealing rubber lid. The Ssalad dressing remains in it’s jar until you’re ready to eat. 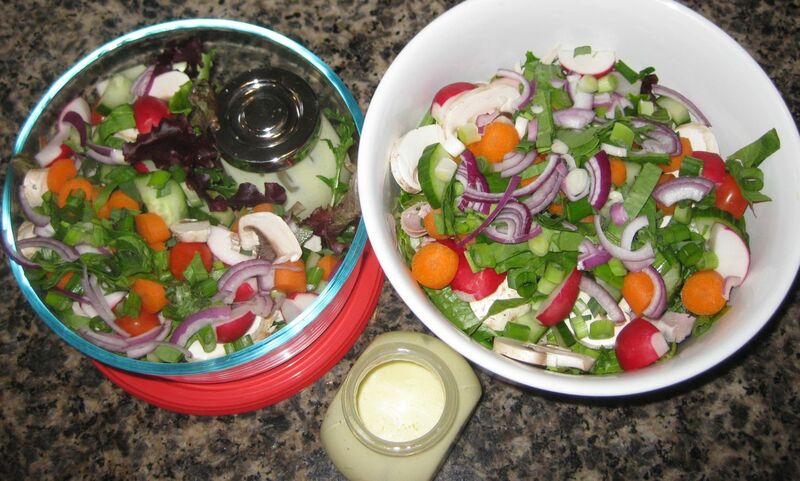 If you have a small jar for the dressing, just nestle it in with the salad ingredients. When lunchtime hits, simply drizzle as much dressing as you want over your salad, fork toss, and enjoy. I love a good ranch salad dressing, and I don’t have go-to recipe for it like I do with vinaigrettes and citronettes. You’ve seen my experiment with buttermilk ranch vinaigrette. This time, some leftover homemade sour cream veggie dip* looked like the perfect addition to the pseudo-chef’s salad I was planning for lunch. I bemoaned the absence of romaine or green leaf lettuce because I love their crunch with creamy dressings and deli meat. Instead, I made do with some mixed baby greens I had on hand. 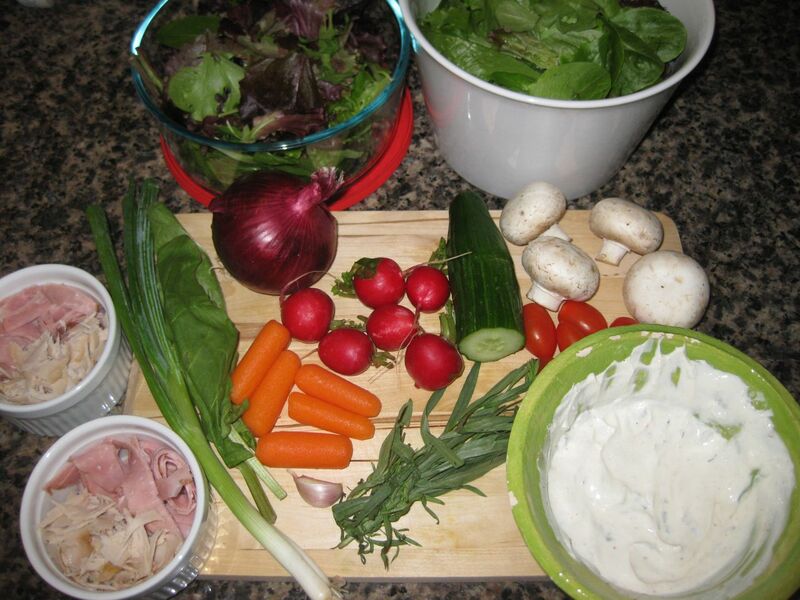 Then I grabbed the ham, turkey, cucumber, radishes, cherry tomatoes, carrots, mushrooms, and scallions — all ingredients that work really well for me with ranch dressing. I added tarragon and savory for extra flavor. And I got to chopping. The ingredients, ready for action! 1/4 cucumber, quartered and sliced. 2 large mushrooms, halved and sliced. 3 cherry tomatoes, left whole. If serving instantly, slice in half. 3 thin slices of red onion, quartered. 2 slices of honey ham, sliced. 2 slices of turkey, crumbled. 2 sprigs of tarragon, chopped. 1/2 clove garlic, smashed and minced. A pinch of salt, to taste. I was making two salads for lunch, so I doubled all of the ingredients listed above, including the salad dressing. I mixed the ranch dressing in a small jar, tasting as I went to make sure I liked the flavors. It looked like a lot of dressing (I thought it would easily work for three salads), so I put some of my husband’s serving into my jar, which would be staying at home in our fridge. I thought we could enjoy it later. With the sour cream ranch dressing mixed up, I started chopping veggies and adding them to the two beds of lush baby greens I’d built. The bowls filled up fast! I left the cherry tomatoes whole so that they would travel well. I nestled the dressing jar in the glass container for my husband before popping the red rubber lid on it. Mine just went into the fridge for lunch time. Yummy! This was the creamiest dressing I’ve ever made, and due to the inclusion of the sour cream dip, it had a really nice depth of flavor. I used every drop of the dressing I set aside for myself. (Remember, I thought I had enough for two salads? Wrong.) My poor husband texted me at lunch time to tell me that he loved it, and he’d never worked so hard to get every drop of dressing out of the jar before… Moral of the story? Really thick, creamy dressings don’t spread as well as light vinaigrettes. Or we just both adore lots of good, sour cream ranch deliciousness with our crunchy cucumber, radish, and carrot bites. This salad was really filling. I didn’t mind the softness of the baby greens as much as I thought I might, though I still think romaine or green leaf lettuce or even a very fresh iceberg would be a better match for the creamy salad dressing. It was still tasty, and I ate every bite. In fact, I was so hungry and it was so good that I didn’t realized I’d failed to snap a picture of it fully dressed until after I’d devoured every last bit. Oops… I will have to continue experimenting with ranch so you get more pictures of creamy delectability. Done. 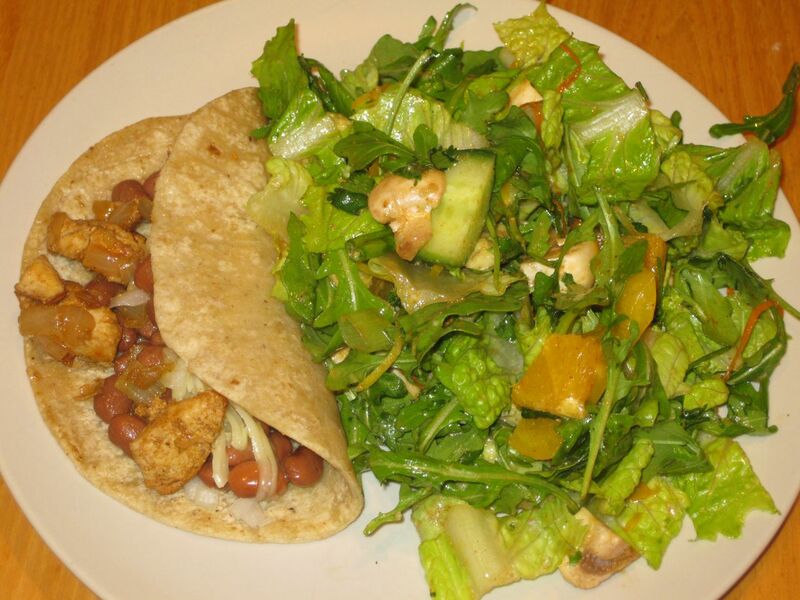 For a veggie version, skip the deli meat and toss in your favorite beans or some cheddar cheese. 1 sprig of tarragon, finely chopped. 1 scallion, very finely chopped. Dash of rice wine vinegar. Pinch of garlic powder, to taste. Pinch of smoked paprika, to taste. Pinch of Trader Joe’s 21 Season Salute, to taste. Freshly cracked black pepper, to taste. My husband whipped this up on the fly. Combine and sample and tinker with the ingredients until it pleases you. We went heavy on the garlic powder and light on the smoked paprika. Lime Citronette with Leftover Chicken, Mandarins, Mint and Cilantro. When life gives you leftovers, make salad! Leftover protein and vegetables are amazing in salads. It’s a quick, easy way to make a delicious, nutritious meal. It’s cost-effective, because the leftover ingredients go further in a salad than they would on their own, and it’s fun, because you’re not actually eating the same damn thing twice in a week. So, I was short on time and creativity, and I had some excellent leftover chicken tenderloins and some cooked corn. I rooted around for lettuce, mandarins, fresh herbs, and other veggies, and I made the best of it. The ingredients, ready to be transformed! 2 hearts of romaine lettuce, chopped. 3 mandarins, peeled, cut in half, and quartered. 1 avocado, quartered and sliced. 1 red bell pepper, sliced. 2 chicken tenderloins, leftover, cooked with onion, chopped. 1/2 cup of cooked corn. 1 fistful of mint, chopped. 1 fistful of cilantro, chopped. I made a lovely bed of romaine lettuce and zested my lime over it. Then I whipped up my citronette in a small jar, and started chopping. I added the chicken, vegetables, and herbs first, saving the avocado and mandarin for last so that they would be bright and colorful. I don’t like brown avocado, and I prefer for citrus fruit to go into salads at the last minute so it doesn’t wilt the lettuce. Once all of my ingredients were properly sliced and diced, I drizzled the dressing over the top and tossed it before serving it up. Rainbow deliciousness, ready to eat! Straightforward and delicious. 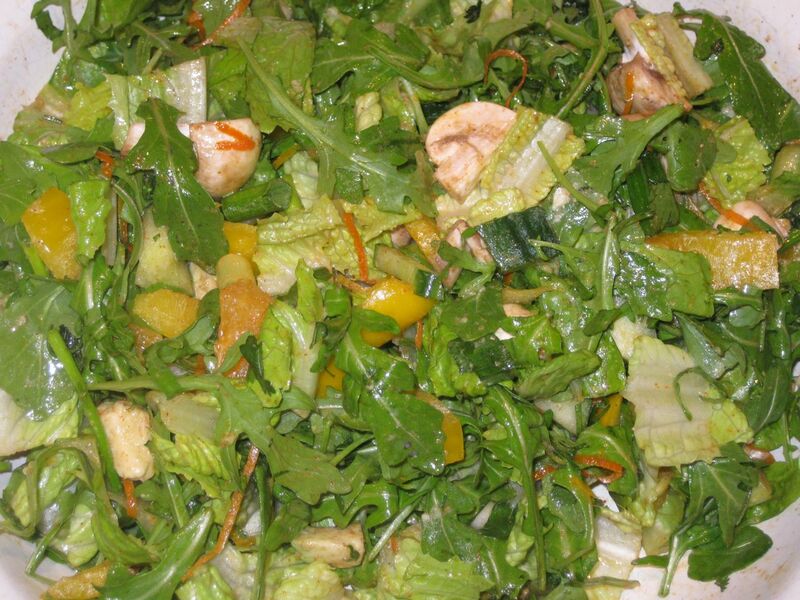 The mint and cilantro brighten up the salad, and the juicy mandarins work well with the creamy avocado. The simplicity of the lime citronette works well with the leftover chicken and corn, and helps bring all of the flavors together. 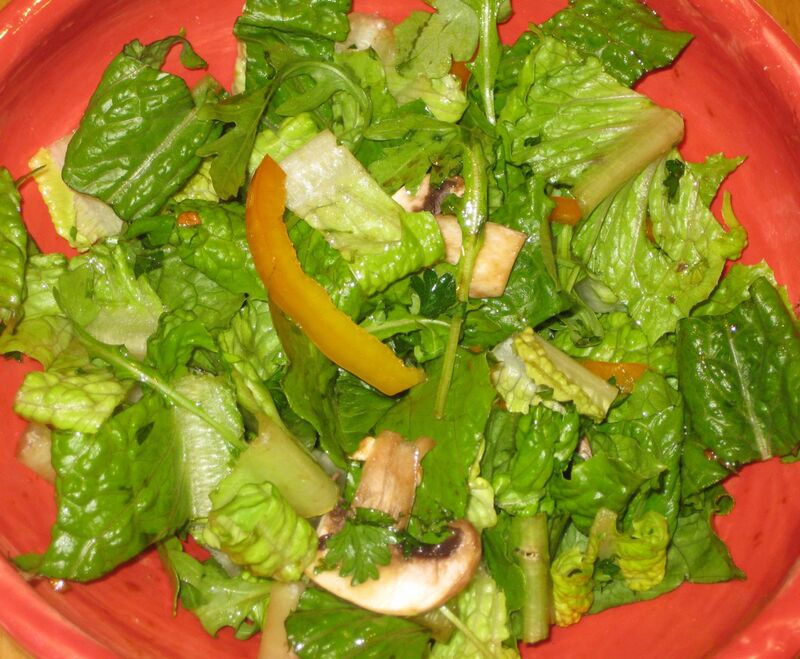 The crunchy red bell pepper and the crisp romaine lettuce keep the salad fresh and the textures diverse. This was a perfect example of how using leftovers meat and cooked veggies in salads is a great way to streamline cooking while keeping the food fun, tasty, and interesting. Done. For a vegan salad, swap out the chicken for garbanzo beans, cannellini beans, shelled edamame, or lightly seasoned tofu, and add a smashed and minced clove of garlic to the lime citronette for a little extra flavor. As usual, the avocado and citrus fruit go in the jar with the salad dressing (this keeps the avocado from browning and the mandarin juices from wilting the lettuce). Everything else goes in a large glass or stainless steel container with a lid. Combine when you’re ready to fork toss and enjoy! Improvising for dinner again, I needed a kid-friendly salad to accompany the chicken tacos they wanted. I went for a southwestern citronette, happy for a chance to play with the ingredients for one of my favorite salads. 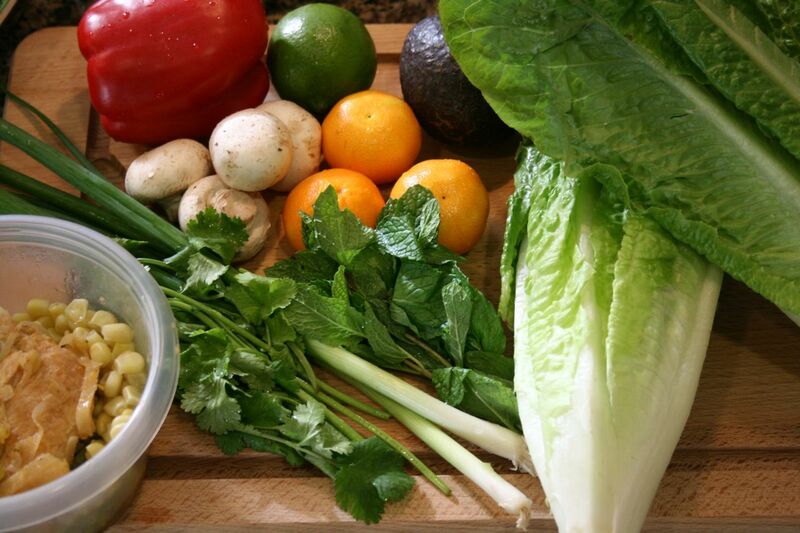 I pulled a heart of romaine and some arugula out of the fridge, and grabbed a yellow bell pepper, mushrooms, a cucumber, cilantro, scallions, and of course some citrus fruits. Impressed by the beautiful colors, I snapped a picture and got to work. Here are the ingredients, ready to chop. 1 yellow bell pepper, sliced. 1 avocado, quartered lengthwise and sliced. 1/4 english cucumber, quartered lengthwise and sliced. 1 navel orange, skin sliced off, quartered and sliced. Zest of one navel orange. 1 garlic clove, smashed and minced. Tossed and ready to serve! While the chicken for the tacos cooked, and my husband crisped the corn tortillas, I created a gorgeous bed of salad greens and zested the citrus fruit over the top. Then I juiced the lemon and prepared my citronette in a small jar. I doubled the maple syrup this time (from my typical half of a teaspoon for this type of salad to a full teaspoon). I’m not sure why I did that — in part to appeal to the kids, but it also just tasted right to have a sweeter dressing with the spicy arugula. 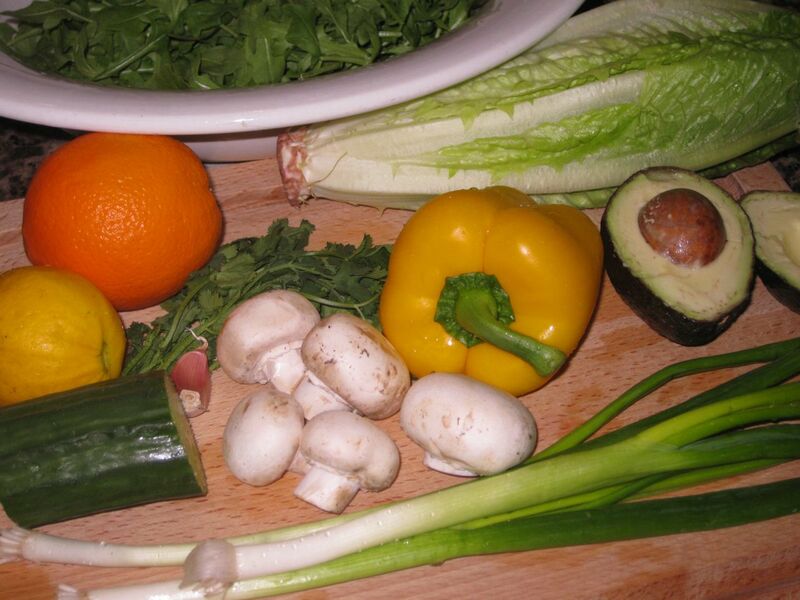 With the citronette made and mellowing, I started chopping and adding vegetables to my bowl. I saved the avocado and the navel orange for last so that the avocado would be lusciously green and the citrus juice wouldn’t wilt the lettuce. On the plate and ready to enjoy! The salad was delicious. It worked really well with the tacos, and was devoured by everyone at the table. Complete success! Easy enough — add pinto beans, black beans, leftover chicken, steak, carnitas, or shrimp, and then sprinkle some corn chips over it for extra crouton-style crunch. 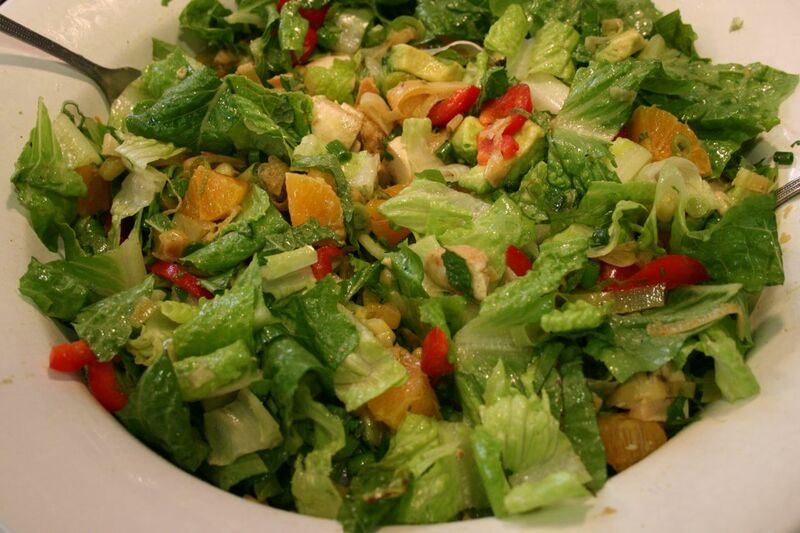 Avocado and orange need to be packed in a jar with the salad dressing. 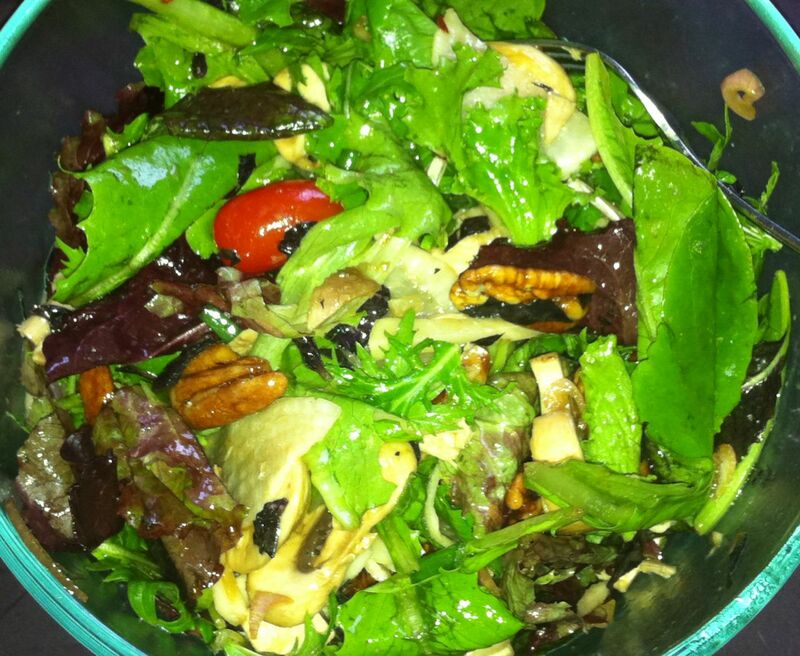 The rest of the salad is fine in a nice large glass or stainless steel container with a good rubber lid. Nestle the jar in the salad container and store it in the refrigerator. When you’re ready to eat, simply shake the dressing and pour it over the salad. Use only what you need (use a fork to pull the yummy fruit out of the jar without getting more citronette than you want). 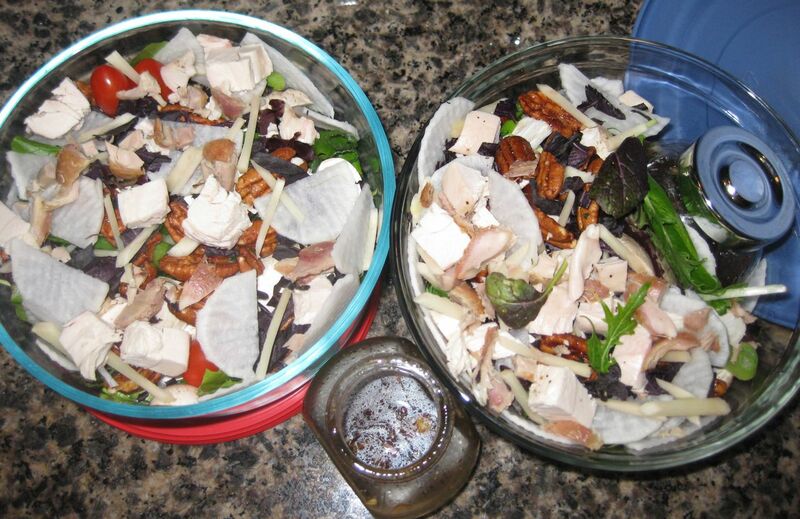 Fork toss your salad, or put the lid back on the salad container and give it a few good shakes to combine. Enjoy! Arugula, leftover chicken, asparagus, and red wine vinaigrette. Basil, scallion, mushrooms and radishes ready for slicing. Since I was supposed to be walking out the door for a homeschooling park day when I realized I hadn’t eaten yet, speediness mattered. I raided the fridge for leftovers and found a jar of shallot red wine vinaigrette, and some sesame chicken with asparagus. I grabbed arugula, mushrooms, basil, and a scallion to make it a meal. 3 generous cups of arugula. 1 fistful of basil, chopped. 2 small sesame chicken tenderloins, sliced. 3 fat spears of asparagus, chopped. 1 T of red wine vinegar. I chopped fast, and dumped everything into the bowl. After drizzling the dressing over the top, I did a quick toss with my fork and then inhaled my lunch. Even when salad is quick to make, it’s never very quick to eat, but I did my best. Dressed and ready to eat! Diverse flavors, many tasty bites, but the salad as a whole didn’t quite hang together. I think the basil and asparagus didn’t mesh as well as I’d hoped. If I’d had more time, I would’ve made a citronette instead, and replaced the basil with mint and lemon zest. I think a bright, citrus dressing would’ve been a better fit with the chicken and asparagus leftovers. Still, it was a decent lunch and provided me with plenty of energy for the park outing. This one would work well to go, just as-is, but why bother? Make a citronette instead, and use mint and lemon zest instead of basil. The ingredients are all hardy enough to handle spending the morning in the fridge. So, pack all the salad ingredients in a large container. The dressing goes in a small jar (I like jars that are little enough to nest inside the salad so you’ve just got one item to haul around). Add some dressing (start with a little so you don’t drown the salad), fork toss, and munch away. Time for a simple lunch salad, just for me. I wanted to see if beets would work with one of my favorite salad combinations — creamy pears, crunchy candied pecans, and balsamic vinaigrette. 3-4 cups of mache and mixed greens, including radicchio and frisee. 1/2 a pear, quartered, cored, and sliced. 1/4 cup of candied pecans. 1/4 cup of dried, sweetened cranberries. 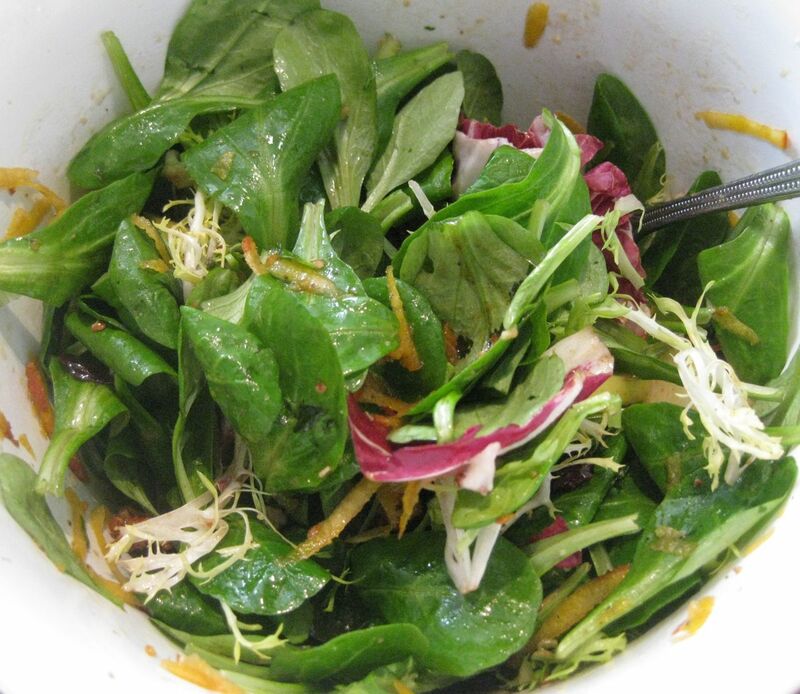 1/4 cup of grated golden beets. Freshly ground pepper, to taste. 1/2 clove of garlic, smashed and minced. First I prepared my salad dressing in a small jar, giving the garlic time to mellow and infuse the vinaigrette. 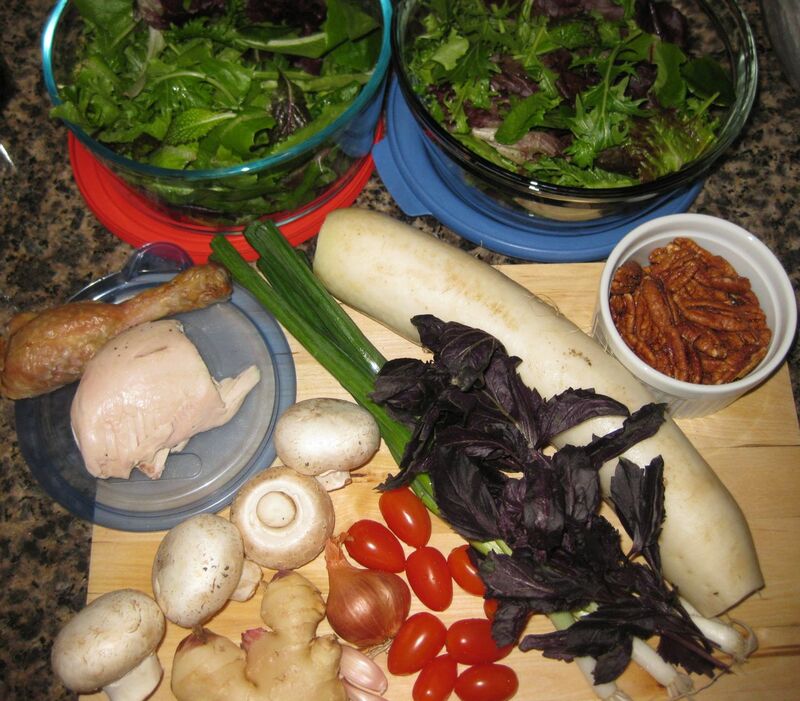 I created a nice bed of greens, chopped my pear, and added everything to the salad bowl. I gave it a good dusting of pepper before drizzling the vinaigrette over it and tossing it. A dessert of a salad, ready to eat. The beets weren’t that noticeable, honestly, and the salad was a little sweet for me. I love these flavors as a side salad, but I don’t recommend it as a lunch salad unless you’ve got a pretty serious sweet tooth. (Bear in mind that my husband thinks I’ve got a genetic mutation that disables the normal human appreciation for sugary goodness, so if this sounds amazing to you, go for it. There’s a good chance I’m the weirdo, not you.) Regardless, I would have loved this salad if it shared a plate with a really good pork chop and some roasted potatoes. Done, but not recommended. Serve it on the side with something delectably savory instead. Apples go in with the dressing to prevent browning. If it’s sitting for a long time, the beets will also brown, so bear that in mind and plan accordingly. As always, add your dressing at the last minute, only as much as you need, fork toss, and enjoy.